This April, the children are our future. HARBINGER WARS is coming! Valiant is proud to announce HARBINGER WARS #1 (of 4) – the FIRST ISSUE of a four-issue limited series that will set off the first-ever family crossover for the all-new Valiant Universe! Then, the Harbinger Wars saga continues with new jumping-on points in BLOODSHOT #10 and HARBINGER #11 – the beginning of brand new, standalone story arcs that will cover the collateral damage of the Valiant Universe’s first full-scale conflict. For decades, Toyo Harada’s Harbinger Foundation and the government’s own Project Rising Spirit have been waging a secret war over the rarest resource known to man – the unwieldy superhuman telekinetics known as harbingers. Over the years, they’ve each collected a small army of these empowered children to inflict their agendas on the world. 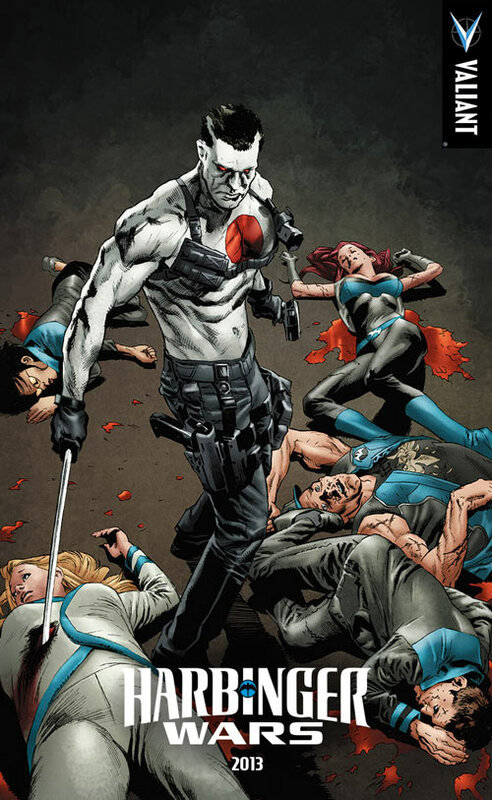 But now the reformed harbinger hunter known as Bloodshot needs to atone for his crimes – and he’s going to start by releasing two dozen of the most volatile harbingers from their PRS prison and into the world. Bloodshot wants to lead them. Toyo Harada wants to control them. And, Peter Stanchek, a teenage renegade with immense powers of his own, wants to give them free rein. But the runaway children of PRS have their own ideas for the future…and, as the body count rises, the Valiant Universe will realize that power this immense cannot be contained. It must be exercised. Who will survive the Harbinger Wars? This April, the entwined destinies of Bloodshot, Peter Stanchek and Toyo Harada will finally collide…and the most powerful forces in Valiant Universe will be drawn into a battle without sides, without rules and without mercy. Do not miss the first shot fired in HARBINGER WARS #1 (of 4) – coming this April from Valiant! HARBINGER WARS #1 (of 4) – ON SALE IN APRIL! BLOODSHOT #10 – ON SALE IN APRIL! HARBINGER #11 – ON SALE IN APRIL!